The process with the Works In Progress (WIP) writing group seems to be going well. I am submitting two to three chapters each week to the other writers for feedback and receiving the same from each of them. It's nice for many reasons - but one reason is that one person has never read any of my writing so this is all fresh to her. Another reason is that this timeline we've set up seems to be working well for me in terms of editing. If there were more of us or we were trying to submit more to each other, it would probably be too much. I still usually come in under the word limit we've set; it's how my chapters run. 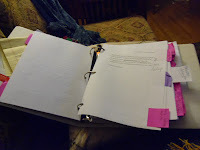 One week I had three chapters but after the editing I was about 1200 words below the limit. Coming in under the word limit is not a problem. And there isn't a problem. Let me say that right now. No problem at all. The editing is going smoothly most of the time. Much better than previous experiences tackling big writing project. And I'm actually enjoying some of the editing process - which is not my norm, and I'm happy about that. Because I am not a spit it out in one draft, have it ready to read, kind of writer. Not that I know any writers like that. I was just remembering a new writer a couple of years ago who was surprised at all the editing and drafts and deletions from the version he typed up; he got over it, though it was a bit of a shock. I'm editing out some things which I thought were for sure keepers. I've taken out some darlings, for sure. And there are some places where I wonder why I ever wrote it like that. The writing has changed and that's good. Honestly, it's improved (what a relief, right?). So it feels good to be making some of these edits and the better word and phrase choices sometimes appear on their own; less struggle; they fit. One dilemma is the title. I don't like it. I thought it was kind of clever and charming and fit so well earlier in the process. But now I'm not sure. No, I don't think it helps make it any clearer and I think it might actually set up some expectations which aren't met because it's not the right title. I've been calling it this since it first became more than a few creative non-fiction/memoir short story pieces and became an It - a Book in Progress. 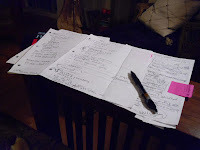 The book is progressing and it feels good. And I've decided to just keep on with the editing and rewriting and wait. A new title will come to me when it's time; when the book is ready to release its name.